Barry Engle followed an increasingly common career route this month when he became CEO of a small electric-vehicle company. Engle, the former CEO of Ford of Canada, will head Think, the Norwegian EV maker planning retail expansion in the United States. That makes him part of a wave of former executives from automakers and big suppliers who are jumping into small, entrepreneurial companies. For the execs, the move represents a fresh challenge and, sometimes, a chance to restart a career. For the startups, the executive can bring credibility, contacts and know-how. "We bring, obviously, a set of experiences and a discipline and an organization that may not exist at some of the smaller companies," Engle says. "They haven't been around long enough and seen everything that the rest of us have." He says there is "something invigorating" about moving into a small, innovative company. "These are small, high-growth companies that really don't have time for the bureaucracy that the larger companies have built up over the years," Engle says. "There's an energy, there's a passion, especially in the electric-vehicle space." Another Detroit 3 veteran, Jim Taylor, recently became an adviser and board member at AMP Holding Inc., a company near Cincinnati that retrofits vehicles as EVs. Taylor, who was CEO of Hummer during General Motors' unsuccessful attempt to sell the brand, also was general manager of Cadillac and a vehicle line executive at GM. Taylor says companies appear to seek auto executives to help them move from product development to sales. That's when founders need industry contacts and expertise, he says. "A lot of guys can whip up a piece of hardware, but then they start to ask: 'How do I deliver and sell this thing? How do I service it?' "
In many cases, little-known companies reach out for people who bring not only management experience but also credibility. Two years ago, Purcell retired after 28 years at GM. 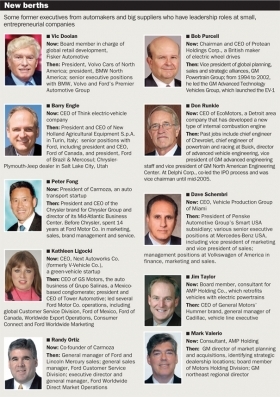 He last job there was vice president of global planning, sales and strategic alliances for GM Powertrain. Purcell also spent eight years heading GM's Advanced Technology Vehicles Group -- where, among other things, he oversaw the launch of GM's electric car, the EV-1. Now 58, Purcell was invited this year onto the board of a fledgling British venture called Protean Electric. Within six months he was named CEO of Protean Holdings. Protean is trying to market a technology for electrifying existing vehicle platforms. The proposal is to place small, lightweight electric-motor drive systems into the wheels of a vehicle, replacing the internal combustion engine. Purcell is a "name," he says. And names open doors. "When we announced that I was named CEO, we put out a news release at midnight," Purcell says. "By 9 o'clock the next morning, two different automakers had asked me to come talk to them about what we're doing." Credibility and name recognition are key for many startups. Another case in point: EcoMotors International of suburban Detroit. EcoMotors is the brainchild of Peter Hofbauer, the German engineering executive who created Volkswagen's first diesel engine, and the venture capitalist Vinod Khosla. Hofbauer has patented a new engine design that EcoMotors says will cut the weight of traditional engines, improve efficiency, reduce emissions and be less costly to manufacture. Last year EcoMotors appointed former GM executive Don Runkle as CEO. Runkle's curriculum vitae is hefty: vice chairman of Delphi Corp., head of Chevrolet engineering, head of Chevrolet racing, director of GM advanced vehicle engineering, head of Buick racing, an automotive private equity director, chairman of EaglePicher Corp. and co-creator of the industry's Advanced Battery Consortium with the U.S. Department of Energy. One of his first missions as CEO was to raise EcoMotors' profile among investors. In May, Runkle made a 15-minute sales pitch to Bill Gates, the billionaire founder of Microsoft Corp.
That led to dinner that night with Gates to discuss EcoMotors and Hofbauer's proposals, and that resulted in Gates' decision to partner with Khosla in a $23 million investment in the venture. "I've been around a little," Runkle says. "So far we've talked to about a dozen OEs about our technology. So far no one's thrown us out." Would Gates have lent his own name recognition to the engine venture without Runkle's involvement? Possibly. But decision-makers outside the industry have no way to evaluate an unproven technology. What they can size up are the credentials of those who endorse it. Mike Lehmkuhler, an economic development official for the state of Virginia, does that when unknown companies approach. As managing director for strategic properties and projects for the Virginia Economic Development Partnership, Lehmkuhler meets with automotive ventures regularly. "The first question I ask them now is: 'Who's on your management team? Who's on your board?' " Lehmkuhler says. "I'm looking for people in the organization who are credible and know what they're doing." Former Chrysler brand CEO Peter Fong says credibility is critical in approaching customers. "It's important to be able to have your phone calls returned and to have people respond to invitations to meetings," Fong says. "That's been pretty easy for us." By "us," Fong is referring to himself, auto leasing and dealer training executive Eustice Mita and Randy Ortiz, who retired in March at age 52 as Ford Motor Co.'s general manager of Ford, Lincoln and Mercury sales. Together with Fong, 46, the former Detroit managers plan to take Carmoza, a vehicle transport startup, into the fast lane. Fong is president of Carmoza, and Ortiz a partner. "We're talking to all the big dealer groups in the country," says Ortiz, who is drawing a Ford pension. "Peter and I know what dealers face in moving vehicles. A third of their sales are often dealer-to-dealer trades, and there is no national brand serving them." Credibility cuts both ways, Ortiz adds. "When I retired from Ford and I was thinking about what I wanted to do next, I knew it had to be something credible for me," he says. "I spent a lifetime building my career. You don't want to throw your reputation away on a fly-by-night venture."